" If you can't feed 100 people, then feed just one." Monday evening, I joined my Independent Presbyterian Guild members as we served dinner to the women and children guests at First Light Women's Shelter. My granddaughter Eva asked to come with us. Eva donated some of her birthday money on Christmas Eve to this special place. This night she got to see first hand what First Light is all about. She helped us serve pizza and then handed out ice cream. It filled my heart that she was so comfortable and eager to serve. EGGS! It's almost that time you know. What's Really Big and Purple?? NO! Not Barney.....Oz Works in Irondale. 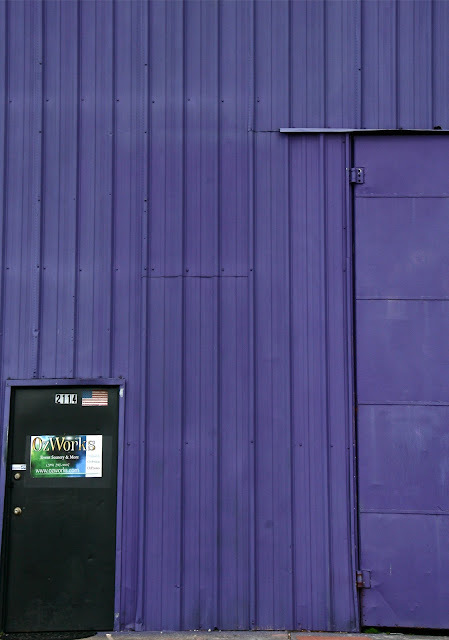 Oz Works specializes in "theatrical scenery, backdrops, props, giant scupltures (Barney?? ), event scenery and more." After reading this, I'm thinking I need to get back over there and sweet talk my way inside and have a photographer's field day! Breaking news: Chris at Oz Works has emailed me and invited me to come by and take photos. Hot Dog!!! 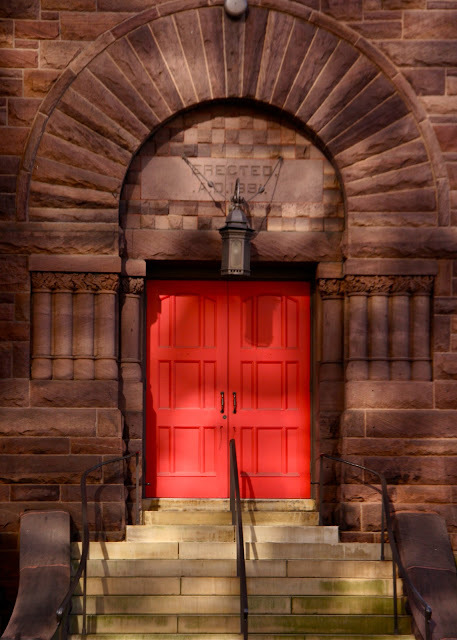 Downtown Birmingham's First United Methodist Church has added some great red doors. A warm welcome indeed. Birmingham Rouge - Gardening Fever ? I think everyone in Birmingham has it. Our weather has been just marvelous and people are out cleaning up their yards and planting up a storm. I think this nice vignette from Charlie Thigpen's great Garden Gallery at the Pepper Place was a good place to start. 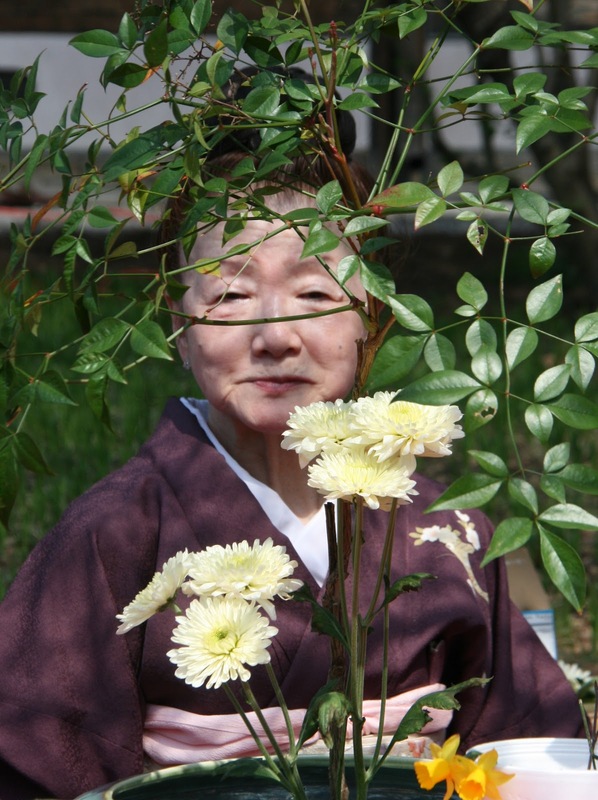 This lovely lady was demonstrating ikebana, the Japanese art of flower arrangment at the Japan America Society Alabama Festival last Saturday at the Botanical Gardens. so I have a lot to share. I hope you won't get tired of it. Birmingham is at its gorgeous best right now. Enjoy! Saturday I dropped by the Birmingham Botanical Gardens for the Japan-America Society of Alabama's annual Cherry Blossom Festival. Today and in the days to come, I will share some images with you. 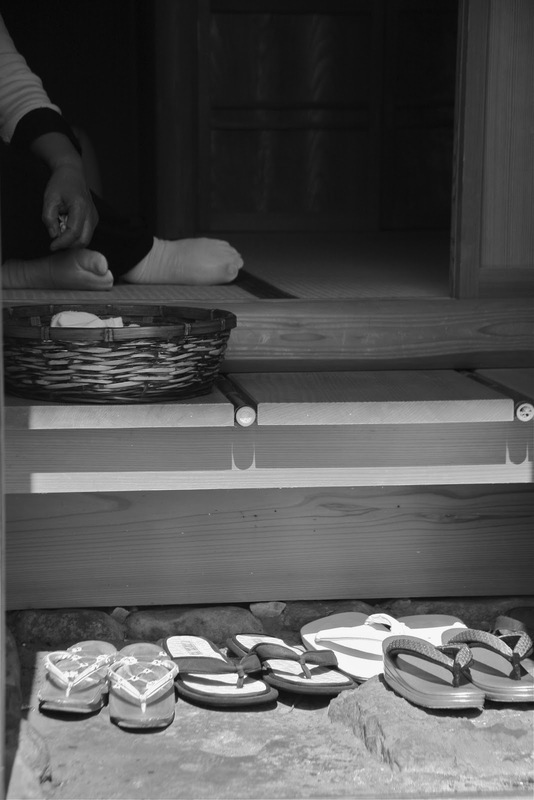 Today's photograph was taken just outside the tearoom where a tea ceremony was in progress. A reminder of the extreme loss that many of the participants are feeling and thoughts of the people of Japan. My friend Elise says I should add, " Have a dandy day!" Well today the country of France celebrates Jour du Macaron! This delightful sweet is one of my favorite indulgances. Why not celebrate right here in Birmingham I say! Yesterday I made a special trip to Continental Bakery in English Village to photograph a plate full just for the occasion. If you are thinking those coconut cookies Grandma use to make - think again. These delicate confections are made with almond powder, eggwhites, and sugar and sandwiched in between is most often a flavored buttercream filling. In France you can buy them in dozens of flavors and colors. Oh la la! To read more about macarons click here. dresses up everything, don't you think? Even historic Oak Hill Cemetery seems happier! Meet Foxy II. This is one lucky pup. He was rescued from a puppy mill by Dinah Toro, an animal lover to the 10th power! Foxy II, is a bit shy, and prefers to spend his days at Charlotte Woodson Antiques, behind her antique frames where he can see himself in the mirror! 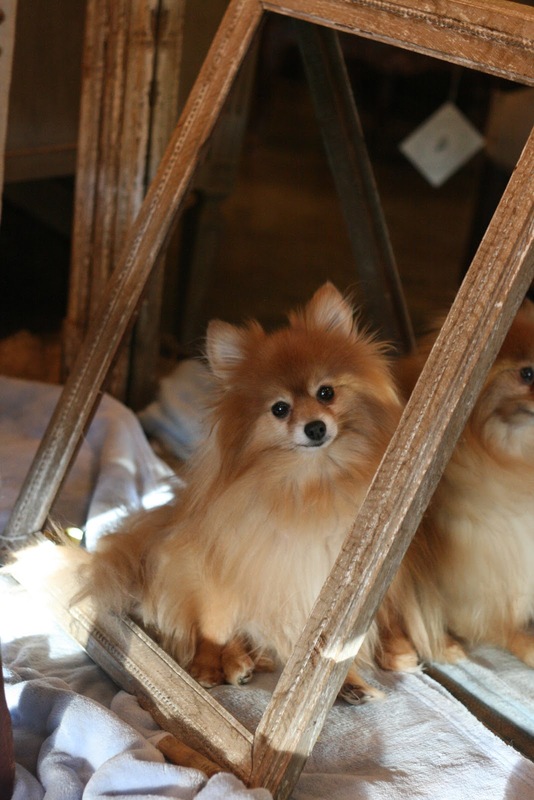 I like to spend my time there visiting with Dinah, over a cup of expresso, and taking endless photos of Foxy! And much love to Kathy ( Mammoth Lakes DP) and Dan who lost their dear precious Daisy recently. I got to meet Daisy while in California last April. Goldens hold a special place in my heart. These lovely cobblestones are used in the "streams" at Linn Park in downtown Birmingham. This day they were dry. The afternoon sun made some nice shadows. One sunny Saturday afternoon, these nice gentlemen allowed me to horn in on their chess game at Linn Park. It was a color thing for me. to take your pet parrot (?) out for a stroll. Yesterday while wandering around the Birmingham Botanical Gardens, we happened upon a couple photographing their pet parrot! He/she was tethered on a little "leash" and was quite willing to let me have a shot as well. is the title of a terrific exhibit at Lite Box Gallery. Curated by Birmingham printmaker Charles Buchanan, it features the works of 30 Central Alabama artists. In addition, the gallery is also offering lectures and hands on workshops. Recently I had the pleasure of photographing a workshop led by Patrick Mayton. 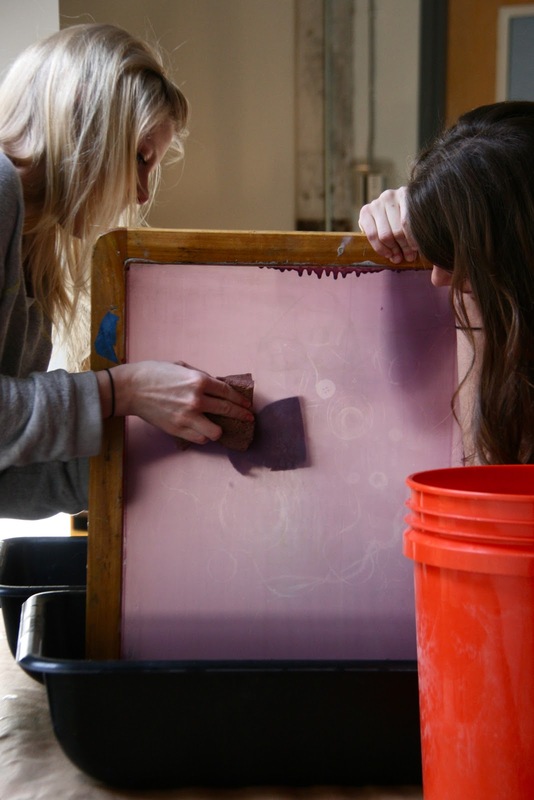 Patrick, part owner of the Stranded Art Co-op in Montevallo, was leading his students through the fascinating silk screen process. The show will hang through March 26th. I have received three new photography books in the mail this week. I'm experimenting with negative space. Can you tell? 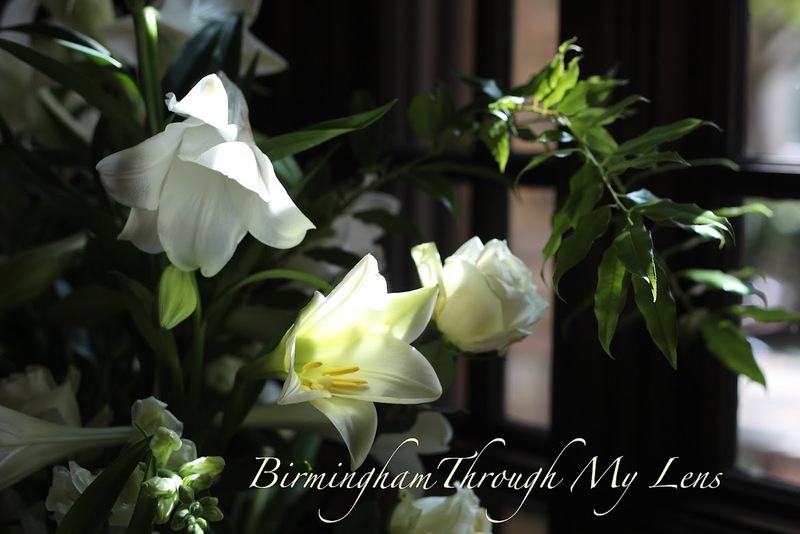 Meet Birmingham photographer Brian Francis. Brian has been a commercial photographer in town with an impressive list of clients for the last 10years. Currently a collection his (wacky) portraits are hanging at the Bottletree Bar and Café. The photographs are great fun in their own right, but Brian's childhood friend Tom Bagby has written an a little story to go with each one. The collection is titled Forgotten History, A Collection of 20th Century Photographs Representing Those Who Failed to Make the Cut. I decided that Brian was way too much fun to have him just pose in front of his work. I waited till he wasn't watching and caught this one. a thousand times NO!! * The gift shop at Sweet Peas Garden Center always has items to tempt me. This basket of vintage yard signs ( first seen on the blog here) just made me laugh out loud! *With apologies to Betty Boop and company. and a Moon Pie short! I was a little under the weather this week and let Fat Tuesday get away from me. I had these fabulous masks from Dinah Toro's Charlotte Woodson Antiques in Mt. Brook, so we'll just celebrate Mardi Gras right here today. By the way, did you know that Mobile, Alabama has the oldest MardiGras carnival celebration in the country?? No just colorful glass windchimes spotted from the front porch of Sweet Peas Garden Center in Homewood. Recently a reader in the UK found me while searching the Barber Motorsports Museum. He asked if I had any photos of a vintage Lotus Mk4. Although I'd featured some Lotus cars, here, it was not the one he needed. We chatted back and forth, and I promised him I'd take another trip out there and see what I could do. This past Saturday, my friend Terry cheerfully chauffeured me, and I was able to find the exact model that was requested. It was way too shiny and special not to share with all of you today. As a note, our museum has the largest Lotus collection in the world! Birmingham's First Presbyterian Church gets a lot of face time on this blog. It's a beautiful place of worship, and from time to time I sit in the carpool line right beside it! Pays to have your camera handy. tulip trees! Spring has arrived in Birmingham, and my neighborhood is just so beautiful. Have a look at this tulip tree that I shot from my car window. We've had some severe weather lately, so these lovely blooms are falling fast. Meet my wonderful yoga teacher, India Henson. India, a hatha yoga instructor at ph Balanced Fitness in Vestavia, is helping me learn to "breathe deeply and let tension flow out of the body". Where has she been all my life?? 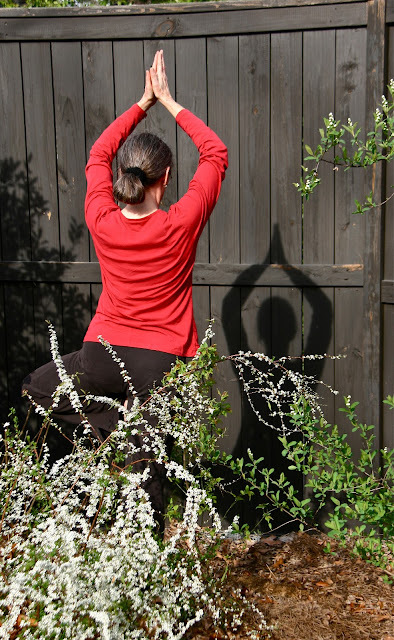 For the record, it will be a very long time before I master Tree Pose in the top photo, but I am quite good at Child's Pose on the left! Oh I love Sweet Peas Garden Shop in Homewood. Just when I think there won't be anything new to shoot there, I pull up and there's this great old convertible in the front. I got weak in the knees. How fun is that! Pepsi-Cola had more of a kick, back in the day when it sold for a nickel. Who knew it was "invigorating"! Spotted on 2nd Avenue North. If you have followed this blog for very long, you will have already guessed my favorite part of town...the Pepper Place Market of course! I have more fun photographing here than almost anywhere else in Birmingham. I'm thrilled that it will reopen the middle of April and go full swing until December. Stay tuned. Today, over 500 of my City Daily Photoblogger friends around the world are sharing their favorite part of town. You'll want to have a look!